The latest actress to be riding the bandwagon of controversies is Kangana Ranaut, for her alleged affair that ended up brutally with Hrithik Roshan denying any relationship with her. The talented actress flaunted her bee stung lips in a couple of movies before taking the plunge into the world of plastic surgery. She is said to have got a lip job done along with breast augmentation. 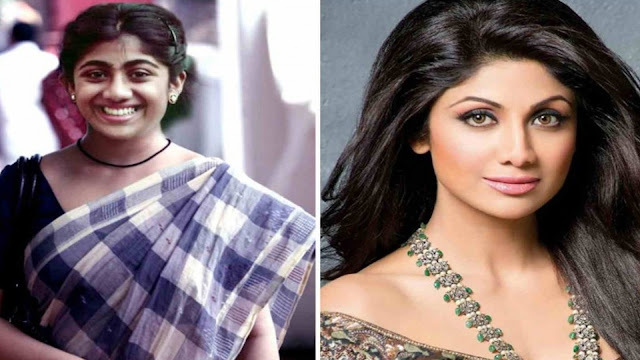 This gorgeous mom-to-be had charming looks and a cute figure in her initial days in Bollywood but then something made her go under the knife for a more beautiful nose. A decision she doesn’t regret and we love her even more for her gorgeous features and that never ending glow. 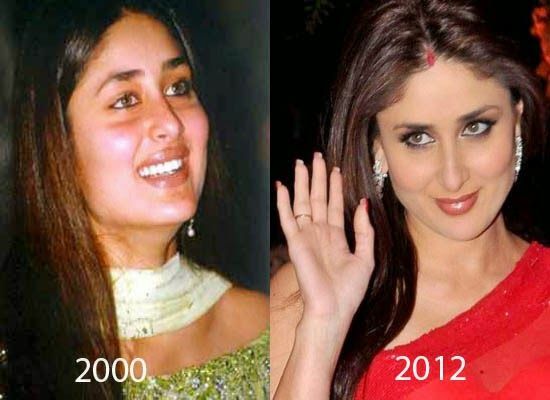 Before the younger sibling took to the route of plastic surgery, the elder Kapoor sister had already set an example of how this surgery can do wonders for you. 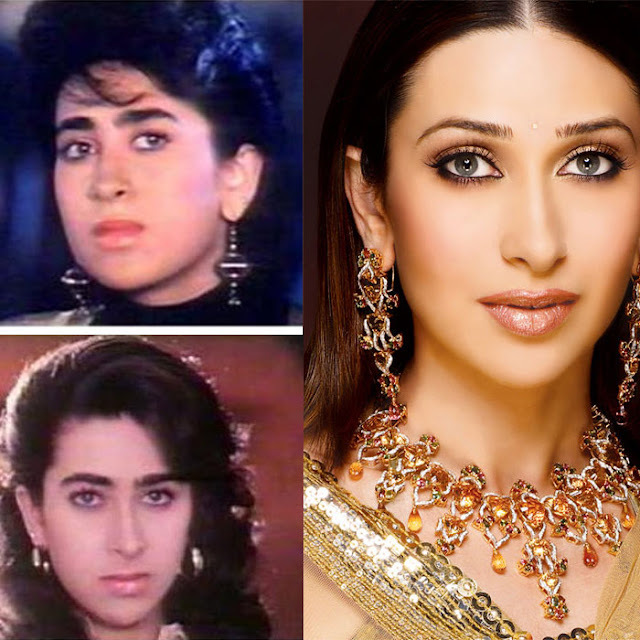 Karishma was just an average looking girl when she made her foray into the world of Bollywood but was heavily criticised for those bushy eyebrows and not so pretty features. 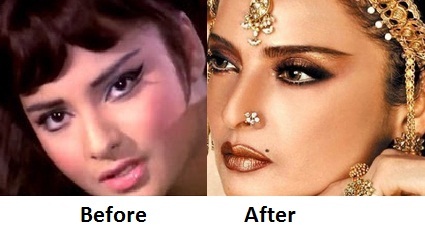 The actress went under the knife and got a face lift as well as rhinoplasty before shooting for ‘Raja Hindustani’. And man, she looked gorgeous! If we talk about most successful plastic surgeries, it has to be Shilpa Shetty. From a dusky, less than average looking girl to one of the hottest actresses in Bollywood, Shilpa’s journey in Bollywood has been quite impressive. The actress is said to have undergone rhinoplasty as well as lip surgery to get those stunning looks that she flaunts today. Rekha was not this glamorous and beautiful in her initial days. She was quite dusky and fat, far from being called beautiful. However, she took a smart decision to get skin lightening treatment and turned the stars in her favour in no time. She still looks quite glamorous as compared to other actresses her age. Rakhi Sawant is the queen of plastic surgery. From breast augmentation to liposuction to botox, this outspoken actress has tried everything possible but unfortunately looked worse with each treatment. How we wish she stayed the way she was in ‘Main Hoon Na’. It is not necessary that plastic surgery proves successful for everyone; some unfortunate ones like Minisha Lamba repent later for the hasty decision. Minisha was termed cute and attractive before she went under the knife for a sharper nose. She is also said to have got silicon implants for a fuller figure in the movie ‘Kidnap’. 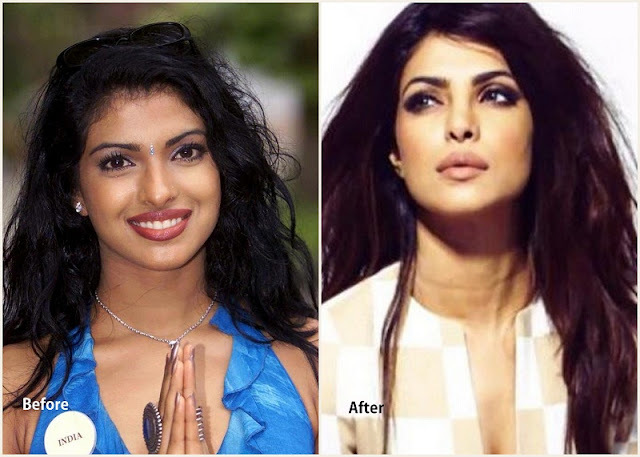 Even after winning the crown of Miss World with her natural features, Priyanka Chopra wasn’t quite satisfied with her looks and went under the knife for rhinoplasty. She is also said to have got skin lightening treatment for a fairer skin.